High Quality Accessories:good quality leather zipper,and the zipper head is metal ,and shoulder strap adjustment buckle is convenient for customer to change the strap's length. The backpack's strap has zippers : The Tunable zipper can be combined ,so you can carry it as an unblance chest sling bag . Or open the zipper ,two straps will let you feel comfortable when you need one blance backpack. 1x one canvas backpack . If there's any reason causes you not completely satisfied with our product, please kindly go to "Orders",click the yellow button "Ask a question". We promise we will give a best solution for you within 24 hours. It is our intention to offer the BEST customer service for our valuable customers on Amazon. UNBLANCE CHEST BACKPACK MATERIAL AND SIZE:Material:High quality Canvas,dimension: 7.8"(L)-2.7"(W) x 15.3"(H)/20 x 7 x 39cm, Weight: 0.81lb/0.37kg. Suitable for IPAD MINI,very simple but fashion,Lightweight but durable and sturdy . 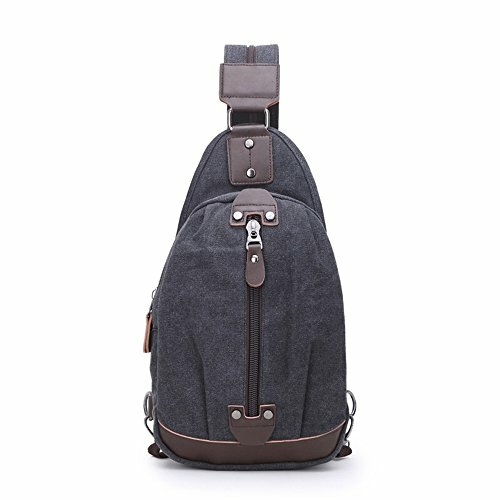 TWO WAYS CARRY ON :Fashionable Multi-function ,practical design Rucksack.Haversack can be used as chest pack and shoulder bag, messenger bag, travel bag.Two ways carry on your shoulder of this duffel bag. A zipper and two good quality hooks on the straps, Open the zipper and Lock the hook on each side when you need one balance small daypack.Zip the zipper and move one hook on same side one cross body shoulder bag appeared,Fit both regular and plus-size person. BLANCE MEN BACKPACK EXTERNAL FEATURES : One small phone case on front ,it very easy to take the phone out.Or can be used to place bus cards, ID cards, student cards）which is easy to bring or take and safe. One anti-theft small bag on the chest bag .It make your money ,coin ,changes won't lost .